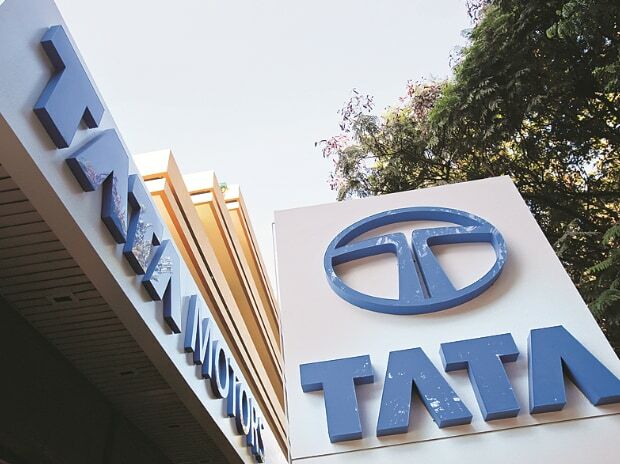 Tata Motors Tata Motors has gained about 13 per cent over the past 10 trading sessions on better earnings growth prospects and on reports that the promoters are increasing their stake in the company. 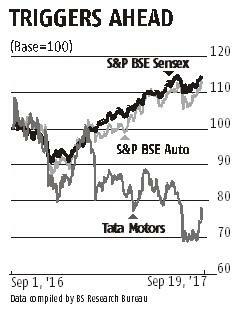 Currently, promoter group companies together have a 34 per cent share in Tata Motors, of which Tata Sons alone holds 31 per cent. Analysts at Bank of America-Merrill Lynch and Motilal Oswal Securities say the second half of financial year 2017-18 (FY18) would be better aided by new launches and changes to the hedging policy. The maker of Jaguar and Range Rover cars is expected to grow faster than peers globally given the product pipeline. Jaguar Land Rover or JLR has lined up as many as six global launches over the year, including three new launches and refreshes. 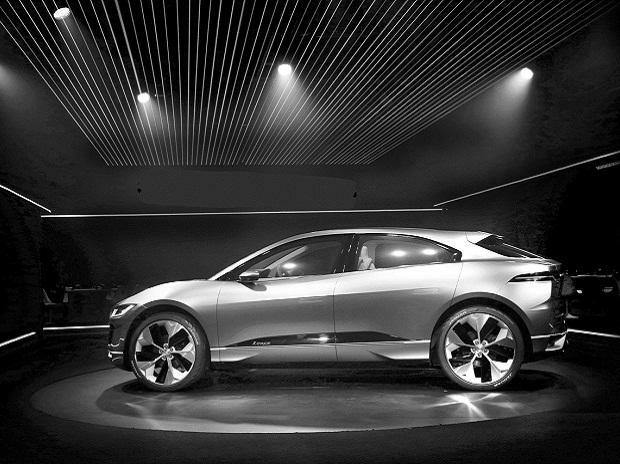 Among the global launches are Velar, E-Pace, and I-Pace (electric vehicle), while Evoque will see an upgrade. The Range Rover and Range Rover Sport will be refreshed. The current portfolio and the new launches are expected to help the company grow its retail sales by 10 per cent in FY18 (as against 4 per cent growth year-to-date). Barring Velar, which has been launched in the US in July and is being launched worldwide, all other refreshes and new launches are slotted for CY18, most of them in January 2018. The last launch from the JLR stable was the new Discovery in March of 2017. Given the timeline of the launches, the significant volume upsides will only come from FY19 as the company gradually ramps up production. The company is also expected to benefit from local manufacturing in China, which will help it price its products competitively and gain on the volume front. The other trigger is the gradual winding down of forex losses, which are expected to fall significantly by Q4FY18. The company has revised its hedging policy (protection from currency fluctuation) from May this year. The company now hedges about 65 per cent of one year forward net foreign exposure as against earlier levels of up to 85 per cent. Analysts at Motilal Oswal Securities say the company did not benefit from favourable spot rates in FY17 on the unhedged portion given lower volumes and, thus, revenues. The lower-than-expected revenues lead to hedges accounting for all the exposure. With the company aligning its component sourcing base with global sales network, it would provide a natural hedge by aligning the forex profile of cost with sales. 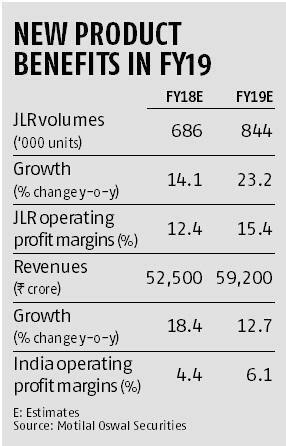 In addition to lower forex losses, analysts believe that a better product mix (higher proportion of new launches) and operating leverage (increased volumes) as well as cost cutting efforts are expected to improve JLR’s operating profit margin by 330 basis points from 12.1 per cent in FY17 to 15.4 per cent in FY19. As a result, the increase in profits could be disproportionately higher than the increase in sales. In the India business, the company is looking to regain the market share of 500 basis points each in the passenger vehicle as well as commercial vehicle (CV) business. While the passenger vehicle business, on the back of recent as well as new launches (Nexon to be launched shortly), is showing volume growth, the CV business continues to struggle given demand concerns. While the company is confident of breaking even in the India business in FY18 on the back of higher volumes as well as cost cuts, analysts believe the standalone entity will make money only in FY20. Nevertheless, the trend should improve from hereon. Given that JLR accounts for all of Tata Motors consolidated profits, it is not surprising that 77 per cent of the sum of the parts valuations is accounted for by the company (including Chinese JV Cherry). Given the price targets in the Rs 515-Rs 550 range, there is at least 22 per cent returns potential from the stock from the current levels.